By purchasing or using Financial Peace University®, The Legacy Journey®, Dave Ramsey’s Generation Change®, Paz Financiera®, Smart Money Smart Kids™, and/or any other Ramsey Solutions™ membership, including any online options (“Ramsey membership materials”), the purchasing individual, church, or organization, or any user of our membership materials (“customer”), accepts the terms and conditions stated herein, including the General Terms, for the public presentation and use of the Ramsey membership materials purchased from The Lampo Group, LLC (“Ramsey”). The Ramsey membership materials include all videos, all course materials, and any guides. The customer is permitted to use and present the Ramsey membership materials for and in connection only with the class or small group associated with the particular Ramsey membership purchased and its enrolled members. The purchase of Ramsey membership materials creates a limited license to present Ramsey membership materials to member classes and small groups only. ANY UNAUTHORIZED USE, COPYING, OR REPRODUCTION, INCLUDING ANY AND ALL DIGITAL DISSEMINATION, OF RAMSEY MEMBERSHIP MATERIALS IS STRICTLY PROHIBITED. If the Coordinator is employed or actively engaged, directly or indirectly through family relationship or professional association, in any financial services industry, including but not limited to financial planning, insurance, or securities, the Coordinator shall not in any way promote the Coordinator’s services or products to the class members. The Ramsey membership materials and the class/small group are not permitted to be a forum for the promotion or sale of other services or materials. If the Coordinator is directly or indirectly associated with any “multi-level” or “network” marketing organizations, they shall not recruit or sell such products to class members. The Coordinator may be privy to confidential financial and personal details of class members. The Coordinator pledges 100% confidentiality on such matters. The Coordinator will not divulge any class member’s information to outside parties other than Ramsey advisors or counselors without the express written consent of the class member. The Coordinator will follow the program process as described in the coordinator guide associated with the specific Ramsey membership purchased. Coordinator shall not change or modify the program content or presentation without written consent from Ramsey. The Coordinator may not edit, transfer to another format, add to, or alter in any way the Ramsey membership materials. Coordinator shall not reproduce, copy, or disseminate Ramsey membership materials in any manner or medium not authorized by Ramsey. This prohibition includes any digital posting, copying, or distribution on any web platform, YouTube, social media, or any other means of digital dissemination. The Coordinator is not an agent of Ramsey and is not authorized to bind Ramsey to any contract, obligation, or pledge of any nature. Coordinator is prohibited from entering into any agreements or making any representation that may infer liability or cause financial responsibility on behalf of Ramsey, its suppliers, employees, or assigns. Intellectual Property License Notice: The purchase of Ramsey memberships creates a limited, revocable license for the use and presentation of the Ramsey membership materials purchased exclusively as provided herein. All other rights are expressly reserved by Ramsey. The Ramsey membership materials are protected in whole and/or in part by state and federal copyright laws, trademark laws, and international treaty provisions. All title and copyrights in and to the Ramsey membership materials, including but not limited to any images, photographs, animations, video, audio, music, text, electronic applications, and accompanying printed materials incorporated into Ramsey membership materials and any copies of materials associated with the Ramsey membership materials, are owned by Ramsey. No one is authorized to copy any audio, video, lesson, or Coordinator materials without the prior consent of Ramsey. If violated, Ramsey may commence civil action seeking money damages, attorneys’ fees, injunctive relief, and, in appropriate circumstances, criminal prosecution, with all reasonable legal and attorneys’ fees to be paid by the infringing customer and/or third parties. Assignment: The limited rights granted to customer hereunder are not assignable or transferable absent express written authorization from Ramsey. Any unauthorized transfer or assignment shall be void. Ordering Membership Materials: Anyone is welcome to purchase a membership and attend a class. The customer agrees to purchase one (1) membership per family unit enrolling in the class. A “family unit” is a single adult individual, a married couple, or an engaged couple. A family unit includes minor children of a single adult or of a married couple. A “married couple” is defined as one male and one female joined in marriage. An “engaged couple” is defined as one male and one female couple who have set a date to be married within a year of their enrollment. Return Policy: Customers purchasing memberships through a Ramsey Advisor or coordinatorcentral.com may receive special discounts for buying in bulk or for coordinating sales of multiple memberships. These discounts are not available to individual customers buying directly on www.daveramsey.com. As such, Ramsey memberships and materials purchased through a Ramsey Advisor or coordinatorcentral.com are not refundable. This applies to any sale online or through a Ramsey Advisor, whether the memberships were purchased in bulk, in multiples, or individually. Memberships remain usable according to the terms of sale and registration that were in effect at the time of purchase. No Warranty: THE FUNDAMENTALS OF COACHING SITE, ITS CONTENT, AND ALL SERVICES AND PRODUCTS ASSOCIATED WITH THE SITE OR PROVIDED THROUGH ANY OF OUR SERVICES ARE PROVIDED ON AN “AS-IS” AND “AS-AVAILABLE” BASIS. WE MAKE NO REPRESENTATIONS OR WARRANTIES OF ANY KIND, EXPRESS OR IMPLIED, AS TO THE CONTENT OR OPERATION OF OUR SITE OR OF THE SERVICES. YOU EXPRESSLY AGREE THAT YOUR USE OF OUR SITE OR SERVICES IS AT YOUR SOLE RISK. WE MAKE NO REPRESENTATIONS, WARRANTIES, OR GUARANTEES, EXPRESS OR IMPLIED, REGARDING THE ACCURACY, RELIABILITY, OR COMPLETENESS OF THE CONTENT ON OUR SITE OR OF THE SERVICES, AND EXPRESSLY DISCLAIM ANY WARRANTIES OF NON-INFRINGEMENT OR FITNESS FOR A PARTICULAR PURPOSE. WE MAKE NO REPRESENTATION, WARRANTY, OR GUARANTEE THAT THE CONTENT THAT MAY BE AVAILABLE THROUGH THE SERVICES IS FREE OF INFECTION FROM ANY VIRUSES OR OTHER CODE OR COMPUTER PROGRAMMING ROUTINES THAT CONTAIN CONTAMINATING OR DESTRUCTIVE PROPERTIES OR THAT ARE INTENDED TO DAMAGE, SURREPTITIOUSLY INTERCEPT, OR EXPROPRIATE ANY SYSTEM, DATA, OR PERSONAL INFORMATION. Limited Use: Your right to access and use our Site and the Services is personal to you and is not transferable by you to any other person or entity. You are only entitled to access and use our Site for lawful purposes. The content of the Site and our Services are not to be redistributed, copied, resold, or otherwise disseminated unless specifically authorized by us. Your access to our Services provided through our Site is also personal to you and not transferable. You are authorized to use the Services as provided and are expressly prohibited from copying, reselling, disseminating, reverse engineering, or otherwise reproducing the Services, including but not limited to any video, audio, downloadable content of any kind, copyrighted works, and trademarks. All rights not granted herein are expressly reserved. Our Services are most effective when accurate information is supplied. Your access and use of our Site may be interrupted from time to time for any of several reasons, including without limitation the malfunction of equipment, periodic updating, maintenance or repair of our Site, or other actions that we, in our sole discretion, may elect to take. You agree that we may use your feedback, suggestions, or ideas in any way, including in future modifications of the Services, other products or services, advertising, and marketing materials. You grant us a perpetual, worldwide, fully transferable, sub-licensable, irrevocable, fully paid-up, royalty-free license to use the feedback you provide to us in any way. We will not sell, publish, or share your comments or feedback in a way that could identify you without your explicit permission. Proprietary Works: The workbooks, guides, forms, and other materials used in Training are proprietary to Ramsey and protected by law. As stated in the Conditional Limited License section below, Coach is permitted a limited license to reference or use these materials in private coaching sessions. Coach is expressly prohibited from distributing copies or disseminating such material on the Internet or other sources. Purpose of Training: The Training and all other offerings associated with the Training are purely for education and skill improvement to be used by the Coach in private, personal finance coaching sessions with individuals and families. The Training and associated offerings does not endow the Coach with any license, certification, or other credentials that would enable the Coach to offer legal, accounting, tax, investment, or other professional advice. No Warranty: THE TRAINING, ITS CONTENT, AND ALL SERVICES AND PRODUCTS ASSOCIATED WITH THE TRAINING OR PROVIDED THROUGH ANY OF OUR SERVICES ARE PROVIDED ON AN “AS-IS” AND “AS-AVAILABLE” BASIS. RAMSEY MAKES NO REPRESENTATIONS OR WARRANTIES OF ANY KIND, EXPRESS OR IMPLIED, AS TO THE CONTENT OR USE OF TRAINING OR OF ANY RAMSEY SERVICE. COACH EXPRESSLY AGREES THAT USE OF TRAINING OR RAMSEY SERVICES IS AT COACH’S SOLE RISK. RAMSEY MAKES NO REPRESENTATIONS, WARRANTIES, OR GUARANTEES, EXPRESS OR IMPLIED, REGARDING THE ACCURACY, RELIABILITY, OR COMPLETENESS OF THE CONTENT OF THE TRAINING OR OF THE RAMSEY’S SERVICES, AND EXPRESSLY DISCLAIMS ANY WARRANTIES OF NON-INFRINGEMENT OR FITNESS FOR A PARTICULAR PURPOSE. Ramsey may terminate due to a material breach of any provision of these terms and conditions. Ramsey may also terminate Training or any service due to events of force majeure, including but not limited to acts of God, death or sickness of key personnel, natural disaster, weather, terrorism, acts of war, or other events beyond control of Ramsey. Ramsey may revoke any licenses granted hereunder at any time if Coach misuses any license or if Ramsey discovers any defect or infringement of any licensed material. If Coach cancels Training 30 or more days ahead of commencement of Training, Coach may transfer to another session without penalty or receive a refund of the purchase price less $500. If Coach cancels Training 29 or fewer days ahead of commencement of Training, Coach may transfer to another session without penalty or the entire amount paid is non-refundable. If Coach cancels Training after commencement, Coach may transfer to another session without penalty or the entire amount paid is non-refundable. Conditional Limited License: Upon Coach’s successful completion of the entirety of the Training, including all FoC online lessons, attendance at all live training sessions, and completion of the full three- month mentorship, Coach shall have the limited, revocable, non-sub-licensable, non-transferable right to use Ramsey materials in private coaching sessions with individuals and families. In addition, Coach, having completed the entirety of the Training, may publicly disclose that they have completed Training. The following statement is permitted to be used on websites owned by the Coach or other marketing materials produced by the Coach: “[Coach] is a Ramsey Solutions Master Financial Coach.” Any other use is prohibited. The disclaimer in the Required Disclaimer section below must accompany such use. It is expressly agreed that the purchase of Training is not a purchase or transfer of ownership of any Ramsey proprietary materials or intellectual property. Coaches may not promote themselves as providing legal, accounting, tax, investment, or other professional advice, unless they are independently credentialed or licensed to do so. 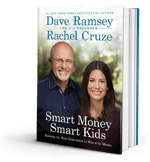 Display any image of Dave Ramsey®, Ramsey Solutions™ or any other brand or product of Ramsey Solutions or its affiliates. This includes, but is not limited to, Financial Peace®, Financial Peace University®, The Dave Ramsey Show®, The Legacy Journey®, Smart Money Smart Kids®, The Total Money Makeover®, More Than Enough, and the Seven Baby Steps. Promote in any way that the Training has given the Coach any education or credentials that it does not, like legal, tax, accounting, investment, or other professional credentials. Make any statement or representation that would suggest or state that Coach is endorsed or employed by Ramsey or is otherwise an agent for Ramsey. Post or disseminate any Ramsey materials online, including any social media sites. Waiver and Indemnity: Without waiving any other limitations or indemnity rights of Ramsey herein, Ramsey assumes no liability and Coach waives any claim against Ramsey for Coach’s use of any Training or materials, including any claims by individuals arising from Coach’s coaching activities. Coach hereby releases, indemnifies, and holds Ramsey harmless from any and all claims related to Coach’s use of the Training, Ramsey’s materials, or any other claim arising from or related to any aspect of Coach’s coaching activities. Fundamentals of Coaching: Purchase of Training entitles Coach to a subscription to Fundamentals of Coaching (“FoC”), an online video course for coaching enrichment. By purchasing Training, the Coach agrees to the FoC Terms of Service. Relationship of the Parties: Nothing herein shall be construed as an employment or agency relationship between the parties. Coach shall in no way be entitled to act on behalf of or otherwise bind Ramsey to any obligation or liability whatsoever. These parties at all times are independent contracting parties. These terms are common to all the foregoing purchases, memberships, sites, or services above, including Ramsey Memberships, Fundamentals of Coaching, and Financial Coach Master Training and all associated offerings. Unless expressly waived or modified by specific terms above, the following General Terms apply. Not Professional Advice: THE LAMPO GROUP, LLC, ITS AFFILIATES, AND THE SERVICES DO NOT PROVIDE LEGAL, TAX, OR FINANCIAL ADVICE. WE ARE NOT A FINANCIAL PLANNER, BROKER, FIDUCIARY, OR TAX ADVISOR. Our Services, communications with our team, and this Site are intended only to assist in educating users on basic principles of personal finance coaching, which does not involve professional financial planning or investment advice. Proprietary Rights: The contents of our services and our sites, including its text, videos, graphics, images, logos, button icons, photographs, editorial content, notices, software, and other material are protected under both United States and other applicable copyright, trademark, and other laws. The contents of our Site belong or are licensed to us or the Site’s software or content suppliers. We grant you the right to view and use the Services subject to these terms. You may download or print a copy of information provided on our Site for your personal, noncommercial use only. Any distribution, reprint, or electronic reproduction of any content from our Site in whole or in part for any other purpose is expressly prohibited without our prior written consent. All rights not granted are exclusively reserved by us. This is not a transfer of ownership in any intellectual property owned by us. Termination: This Agreement will remain in effect until terminated by either you or us as set out below. If you want to terminate your agreement with us, you may do so by closing your account for the Services. Governing Law and Venue for Disputes: This Agreement, all transactions or other interactions with us shall be governed by the laws of the State of Tennessee without regard to its conflict or choice of laws provisions. Any dispute with us, or our officers, directors, employees, agents, or affiliates, arising under or in relation to this Agreement shall be resolved exclusively through the state courts having jurisdiction over Williamson County, Tennessee, except with respect to imminent harm requiring temporary or preliminary injunctive relief, in which case we may seek such relief in any court with jurisdiction over the parties. If you are a nonpaying member or user of our services, you understand that, in return for agreement to this provision, we are able to offer services or products to you, at no charge, and that your assent to this provision is an indispensable consideration to this Agreement. Limitation of Liability and Indemnity: YOU TAKE FULL RESPONSIBILITY FOR YOUR USE OF OUR SERVICES, SITES, AND MEMBERSHIP. YOU ACKNOWLEDGE THAT THE LAMPO GROUP, LLC, ITS AFFILIATES, AND ITS EMPLOYEES ARE NOT ENGAGED IN RENDERING LEGAL, ACCOUNTING, OR PROFESSIONAL ADVICE. OUR SERVICES AND MEMBERSHIP MATERIALS ARE OFFERED TO ASSIST AND EDUCATE YOU IN BASIC PERSONAL FINANCE MANAGEMENT. NEITHER THE LAMPO GROUP, LLC, ITS AFFILIATES, OR ANY THIRD-PARTY VENDOR SHALL BE RESPONSIBLE OR LIABLE TO YOU OR TO ANY THIRD PARTY, WHETHER IN CONTRACT, WARRANTY, OR TORT (INCLUDING NEGLIGENCE) ARISING IN WHOLE OR IN PART FROM YOUR ACCESS TO OUR SITE, YOUR USE OF OUR SERVICES OR MEMBERSHIP MATERIALS, OR THIS AGREEMENT. SUBJECT TO APPLICABLE LAW, THE LAMPO GROUP, LLC, AND ITS AFFILIATES AND SUPPLIERS ARE NOT LIABLE FOR ANY OF THE FOLLOWING: (A) ANY INDIRECT, SPECIAL, INCIDENTAL, CONSEQUENTIAL, EXEMPLARY, LIQUIDATED, OR PUNITIVE DAMAGES, INCLUDING BUT NOT LIMITED TO LOSS OF PROFIT, REVENUE, OR BUSINESS; (B) DAMAGES RELATING TO FAILURES OF TELECOMMUNICATIONS, THE INTERNET, ELECTRONIC COMMUNICATIONS, CORRUPTION, SECURITY, LOSS OR THEFT OF DATA, VIRUSES, SPYWARE, LOSS OF BUSINESS, REVENUE, PROFITS OR INVESTMENT, OR USE OF SOFTWARE OR HARDWARE THAT DOES NOT MEET SYSTEM REQUIREMENTS; (C) DAMAGES OR LOSSES RELATED TO PROFESSIONAL SERVICES OR ADVICE OF THIRD PARTIES, INCLUDING ADVERTISERS. THE ABOVE LIMITATIONS APPLY EVEN IF THE LAMPO GROUP, LLC, AND ITS AFFILIATES AND SUPPLIERS HAVE BEEN ADVISED OF THE POSSIBILITY OF SUCH DAMAGES. THIS AGREEMENT SETS FORTH THE ENTIRE LIABILITY OF THE LAMPO GROUP, LLC, AND ITS AFFILIATES AND VENDORS AND IS YOUR EXCLUSIVE REMEDY WITH RESPECT TO THE SERVICE AND ITS USE. IN NO EVENT MAY YOU BRING ANY CLAIM OR CAUSE OF ACTION AGAINST US OR OUR AFFILIATES MORE THAN ONE YEAR AFTER SUCH CLAIM OR CAUSE OF ACTION ARISES. THE MAXIMUM AMOUNT TO WHICH THE LAMPO GROUP, LLC, AND ITS AFFILIATES, OFFICERS, EMPLOYEES, AGENTS, AND THIRD-PARTY VENDORS MAY BE LIABLE TO YOU IN ANY CIRCUMSTANCE SHALL NOT EXCEED THE LESSER OF (A) THE SUMS PAID BY YOU IN THE PRECEDING TWELVE (12) MONTHS FOR OUR SERVICES OR MATERIALS OR (B) FIVE HUNDRED DOLLARS ($500.00). You agree to indemnify and hold The Lampo Group, LLC, and its Affiliates, Officers, Agents, Employees, and Third-Party Vendors harmless from any and all claims, liability, and expenses, including reasonable attorneys’ fees and costs, arising out of your use of our site, our services, our membership materials, or breach of this Agreement (collectively referred to as “Claims”). We reserve the right, in our sole discretion and at our own expense, to assume the exclusive defense and control of any Claims. You agree to reasonably cooperate as requested by us in the defense of any Claims. Miscellaneous: If any portion of this Agreement is deemed unlawful, void, or unenforceable by any arbitrator or court of competent jurisdiction, this Agreement as a whole shall not be deemed unlawful, void, or unenforceable, but only that portion of this Agreement that is unlawful, void, or unenforceable shall be stricken from this Agreement. If we do not exercise or enforce any legal right or remedy that is contained in the Agreement, such decision on our part will not serve as formal waiver of our rights and that those rights or remedies will still be available to us. All covenants, agreements, representations, and warranties made in this Agreement shall survive your acceptance of this Agreement and the termination of this Agreement. This Agreement represents the entire understanding and agreement between you and us regarding the subject matter of the same, and supersedes all other previous agreements. We may modify this Agreement from time to time. Any and all changes to this Agreement will be posted on our Site. You are deemed to accept and agree to be bound by any changes to the Agreement when you use the Services after those changes are posted. Acceptance of Terms: All terms become effective and binding when you click “I ACCEPT” or you purchase or use any Ramsey membership, product or materials covered by these terms, and is effective until terminated as set forth below. These Terms and Conditions will terminate automatically if you click “I REJECT.” Ramsey memberships and membership materials will not be sold without an acceptance of these Terms and Conditions, and all rights to the same shall terminate immediately upon rejection. In addition, Company reserves the right at any time and on reasonable grounds, which shall include, without limitation, any reasonable belief of fraudulent or unlawful activity or actions or omissions that violate these, to deny customer’s continued use of Ramsey membership materials in order to protect its name and goodwill, its business, and/or the integrity of its message and teachings. The permission and rights granted herein will terminate automatically if customer fails to comply with these Terms and Conditions. Termination will be effective without notice. In addition, the provisions concerning Ramsey’s proprietary rights, indemnity, limitation of liability, warranty disclaimers or limitations, and governing law will survive the termination of these Terms and Conditions for any reason. Termination by Ramsey shall not entitle customer to a refund of any kind.